June 2017 – Welcome to Wyandotte Daily! Concealed carry at Kansas City Kansas Community College will go into effect on July 1, over the objections of most faculty, staff and students. The KCKCC Board of Trustees chairman, J.D. Rios, views it as an expensive unfunded mandate by the state of Kansas, which passed a law requiring people to be allowed to carry guns on public college campuses. “It’s regrettable that we have to allow this,” Rios said. Students, faculty and staff don’t see it in the best interests of the community, he added. “But we have to obey the law,” Rios added. KCKCC has posted signs about the new policy, has posted information about it on its website (kckcc.edu), and has made an educational video about the new policy. Rios said the new concealed carry law may cost the college more than $100,000 – the exact figures will be available after a future meeting, he added. Even if the state had funded it, the college still wouldn’t have supported allowing concealed carry on campus, Rios said. Already, KCKCC’s insurance carrier has dropped the college from coverage because of the risk, Rios said. “The state, of course, didn’t add any money to our budget,” he said. The state made a cut of $400,000 to the KCKCC budget a year ago. KCKCC is considering bringing in a metal detector and guard to selected events that are held at the fieldhouse, according to Rios. He said another board member, the college president and he went to Topeka this spring to testify against concealed carry on campus. He said there were more speakers against it than for it, but the colleges were not exempted. Some of the proponents of concealed carry were state legislators, he added. The state law requires public colleges to allow persons to carry concealed weapons on campus, unless the college sets up metal detectors and security guards at each entrance. KCKCC has so many entrances that it isn’t feasible to post a guard and place a metal detector at each one, according to Rios. State Rep. Val Winn, D-34th Dist., who is also a KCKCC professor, said Wyandotte County’s legislators were only able to repeal concealed carry for public hospitals, not public colleges. She said faculty of public colleges across the state are very concerned about the law going into effect July 1. Some faculty members have left the state universities because of it, she said, but she is not aware of any leaving KCKCC for that reason. “Faculty as well as students need to be very aware of their surroundings,” Rep. Winn said. It is her belief that the college environment is not a place where weapons and guns should be allowed, she said. While legislators who opposed concealed carry on campus tried to amend bills, their attempts were blocked by the majority party leadership, according to Rep. Winn. The concealed carry bill passed in 2012, and an exemption was available to colleges until this July 1. She believes lobbying played a big role in colleges being forced to accept what they did not want. “What really irritates me is the NRA and the leadership, they were negotiating instead of listening to the people of Kansas,” Rep. Winn said. KCKCC sponsored a forum on concealed carry on campus in March, with students attending and expressing their opposition, she said. There is a state Second Amendment group that has support in the Legislature and a PAC that has given funding for campaigns and mailers. The Kansas State Rifle Association PAC reported spending of around $8,500 in January 2017, about $22,000 in October 2014, about $8,700 in January 2014, $8,700 in October 2012, $4,200 in January 2012, $2,200 in January 2010, $10,100 in October 2010, and $4,300 in July 2010, according to campaign finance reports. State Sen. Steve Fitzgerald, R-5th Dist., of Leavenworth, who represents western Wyandotte County, expressed his support for the Second Amendment and concealed carry during a candidate debate last year at KCKCC and also during the forum in March. In an Oct. 17, 2016, candidate forum at KCKCC, Fitzgerald strongly supported allowing guns on campus, saying, “Gun-free zones are killing zones.” He referred to shooting incidents on other campuses nationwide. “Nobody wants a gun in here, until you want a gun in here, and you want somebody next to you or in your own hand, a gun that will stop it.” He said he supported the right of people to defend themselves. KCKCC has its own police department and its own police chief, Greg Schneider. Schneider said the college is covered by his staff 24 hours a day. Schneider said the college had received an exemption to the concealed carry law for the past four years, but the opportunity to get an exemption has now expired. “Effective July 1, concealed carry will be legal on (public) college campuses, unless those campuses provide adequate security measures,” Schneider said. “Basically, that would consist of metal detectors, wands or more elaborate portable metal detectors. With that, you still have to come up with a cost of those products, plus have to have manpower at each entrance as well. From a feasibility standpoint, the state keeps cutting funding, for higher education, so we don’t have money laying around to come up with these adequate security measures. “Since we can’t provide these ‘adequate security measures,’ essentially, guns will be allowed on campus,” Schneider said. 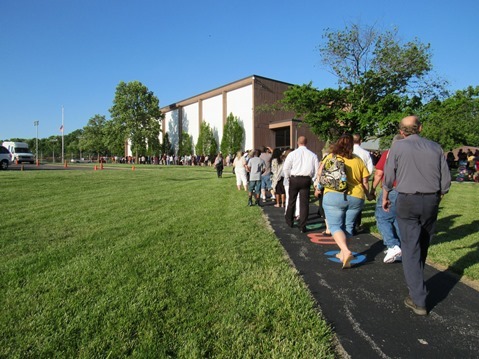 There was a long line to get into the Turner graduation May 15 at the KCKCC fieldhouse. Security measures were being tried out for the graduations this year. Schneider said in his more than 30 years experience, he has not seen a lot of incidents involving guns at the college campus. There has been an incident in the past involving a gun at the college dorm. Now, he said he is trying to get the message out about the college’s new weapons policy and rules concerning concealed carry. Those rules, such as being over 21 and no prior record, and where a gun can be carried, are posted on the college’s website at www.kckcc.edu. There may be areas of “temporary adequate security” where guns are not allowed, according to KCKCC rules. Guns may be stored in a locked vehicle if guns are not able to be seen, but they can’t be stored in desks, lockers and offices. The open carry of a gun is prohibited. The law on concealed carry does not mandate training for those who carry a gun. Each individual who decides to carry a gun should ask himself if he is prepared to carry it or use it, Schneider said. “It comes back to common sense,” he said. Schneider said police officers such as himself are placed in some danger if there are gun incidents on campus. If there is an active shooter incident, he has to respond, he said. If he sees two people pointing a gun, he has to make a split-second decision, he said. He discussed this situation at the college forum held in March on the topic. “What if I take out the so-called good guy trying to help out?” he asked. If he makes the wrong decision and shoots the one trying to help, at that point charges could be filed against him, he could possibly be suspended or lose his job. And with the notoriety that would come with that action, it would be hard to find another job, he said. “Why aren’t we talking about this – what it’s going to do to officers involved,” he asked. He said his job is just to carry out the law, and it does not matter what his personal opinion is. He has to carry out the law to the best of his ability, and make the college the safest environment for everyone who is there, he said. 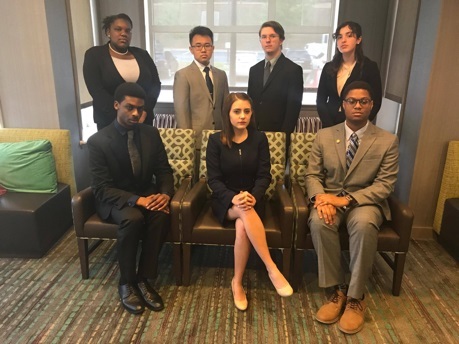 The Sumner Academy Forensics – Debate Team recently competed in the annual National Speech and Debate Association’s National Tournament June 18-23 in Birmingham, Alabama. •	Brandon Bush, Marley Lowe and Michael Franklin. •	Jaleon Brown, Suan Sonna, Simon Folsom and Mikayla Mielkus. Franklin, who was a 2017 (East) District Student of the Year, was one of only six finalists for the 2017 William Woods Tate Jr., National Student of the Year award, out of 141,000 students. Franklin and Sonna are three-time national qualifiers and Lowe and Bush are two-time national qualifiers. 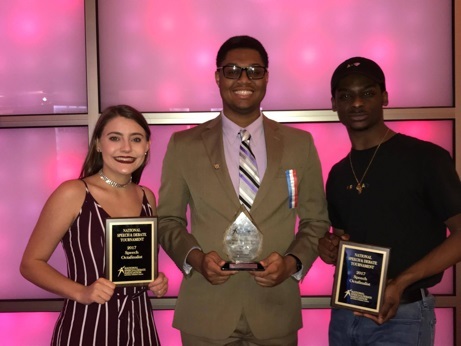 High schoolers qualified for nationals by placing first or second in their events at the East Kansas National Qualifier in April at Shawnee Mission South High School. This was the first national tournament for Brown, Folsom and Mielkus. There were more than 5,000 students from across the United States and multiple countries competing in this event, which is considered one of the nation’s largest academic competition for high school students. The Kansas City T-Bones, behind a dynamic bullpen effort, beat the Lincoln Saltdogs 4-3 Thursday night at Haymarket Park in Lincoln, Neb. The win secured the club’s eighth series win and evened the season series with first place Lincoln at three games apiece. Lincoln grabbed a 1-0 lead in the bottom the first with a solo home run from Christian Ibarra off T-Bones starter Gabe Perez. Kansas City took the lead in the top of the second on a two-run homer from Chantz Mack off Seth Webster and the score was 2-1. Marcus Lemon hit a solo home run an inning later, giving the T-Bones a 3-1 lead. Lemon got another hit later in the game to finish the series 7-for-14. Lincoln then tied the game at three with an RBI single for Matty Johnson that scored two runs for the Saltdogs in the third. That was all the runs Perez (4-2) gave up on the night. He went five innings and struck out six, getting the win. Kansas City grabbed the lead again in sixth. After a single and two hit by pitches by Webster, the T-Bones loaded the bases. Webster struck out Tony Caldwell, but Eddie Newton dropped a pop fly single into shallow center to score the go-ahead run. From there the bullpen did not allow a hit from the bottom of the sixth onward. The combination of Myles Smith, Brandon Sides and Rich Mascheri tossed a three up and three down inning each. In the top of the ninth, Randolph Oduber led off the inning with a walk, but Cody Winiarski worked around it, striking out Ibarra to end the game with Oduber on third. The T-Bones’ six game road trip moves on to Sioux City where the two teams open a three-game series Friday night at Lewis and Clark Park in Iowa. The T-Bones will send out Chris Perry in the starting nod. Game time is 7:05 p.m. and the game can be heard online at tbonesbaseball.com or on the T-Bones MixLR channel. The T-Bones return home Monday, July 3, to face Sioux Falls in the first game of a three-game series and a seven-game homestand.